First destroy the 4 Archer Towers. Then destroy the Wizard Towers by placing lots of archers at the bottom. 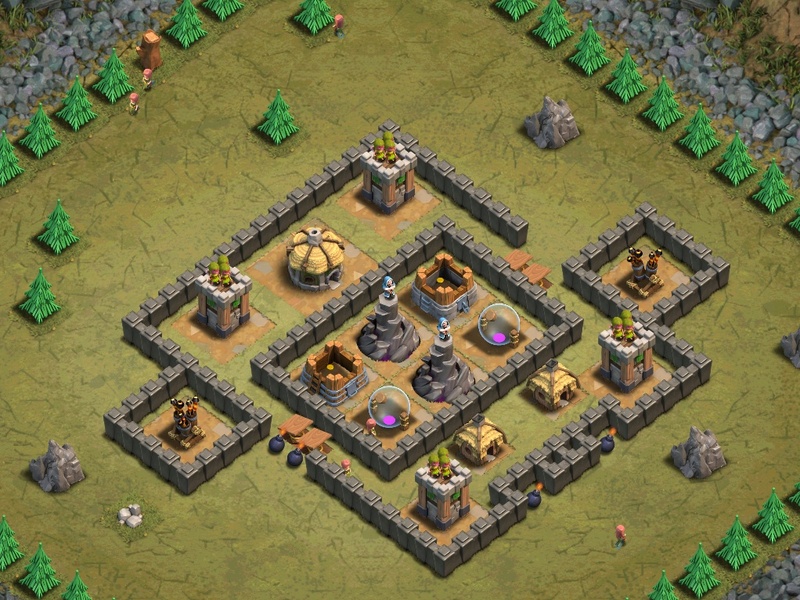 Use 20 Archers for each archer tower to destroy it. Use the Wall Breakers to blow up the bottom wall. Deploy the rest of the Archers to destroy the Wizard Towers. Use 2 or 3 Lightning Spells (depending on level) on the Wizard Towers, and then swarm Barbarians and Archers. However, this is not very cost effective but is useful if you need to dump spells. Or deploy some well-placed Archers at each Air Defense until they are down (you can do this without having Archer Towers shoot at you.) Then, strafe the remaining defenses with Balloons. Lightning Spell the Wizard Towers if necessary. There are five level 3 hidden Skeleton Traps located in this map.